A couple of weeks ago this recipe was making the rounds through a message board of ladies I chat with frequently. I was immediately intrigued because I am a lover of all things cream cheese. I couldn’t quite picture cream cheese in chili form especially made in a crock pot, but after hearing everyone else rave about it, I figured I needed to get it on the menu soon! 1. Combine corn, beans, Rotel, Ranch, chili powder, cumin and onion powder together in a 4 quart crock pot. 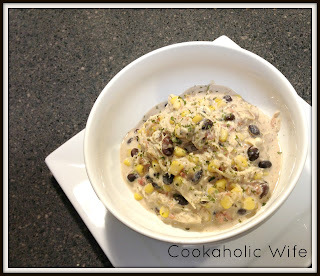 Add the chicken breasts to the crock pot and place the cream cheese on top. 2. Cook on low for 6-8 hours. 3. Stir cream cheese and shred chicken. Serve hot. This was a lot better than I expected it to be. I’d prefer it with more corn and Rotel, but the flavors came through nicely and cream cheese in the crock pot is much better than I expected!